Winters in New England can be very long and bitterly cold. By mid-January, I'm usually praying for spring to arrive, even though I know there's still a good three months before any signs of greenery will begin to appear. The only way that I'm able to tolerate these frigid months, is to be cozy, and because of this I have three items that are a must in my winter wardrobe. The first is a cute beanie. The thing that I love most about beanies, is that they complete your outfit. So whether you're outside, or in, you can wear them and always have an extra layer of warmth, while still looking stylish. Not to mention, they are perfect for covering up a bad hair day! The second item is a blanket scarf, which you all know of my scarf obsession (here). You can wrap yourself up in them, as if you're wearing a big blanket, and they easily add interest or dress up plain top. The third must have item is a great pair of leggings. As much as I love my jeans, there are days that I just want to be extra comfortable, so leggings are my go-to. In fact, I've worn leggings every day this past week, but that will be our little secret. I recently was sent this pair of black leggings from Comm-ci, and you guys, I'm obsessed! Hands down, this is the most comfortable pair of leggings that I have ever owned, and trust me, I've owned a lot. Not only do they have a silk-like feel, but they are a high rise, so they hold everything in, and I love that they are actually a full length on me (yay for us tall girls!) Don't worry, they also come in a cropped length for my shorter girls, plus they have a knee length style, along with straight leg, and low rise options. So far, I've only worn them around the house, but they can easily be dressed with the night top for a night out. I will 100% be adding another pair of these leggings to my wardrobe, and if you want a pair for yourself, Comm-ci is offering my readers a 20% discount with the code: RachaelThreads20. This week's feature blogger is Shannon from Upbeat Soles. I love how she rocks this floral jumpsuit, and if you're ever looking for some great boho inspiration, make sure to check out her blog because she nails the style perfectly! I've been living in big sweaters and leggings!! It's to cold for anything else! Lol!! Love your cozy layers and beanie! This is such a chic winter look! Thank you for the linkup! 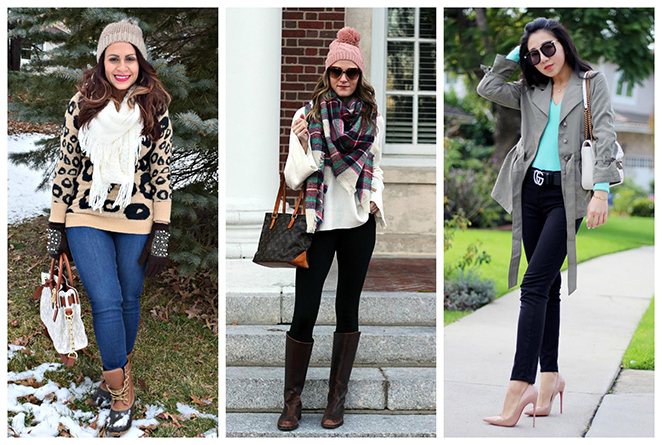 Digging these cozy pieces, lady- that scarf + beanie are so cute! 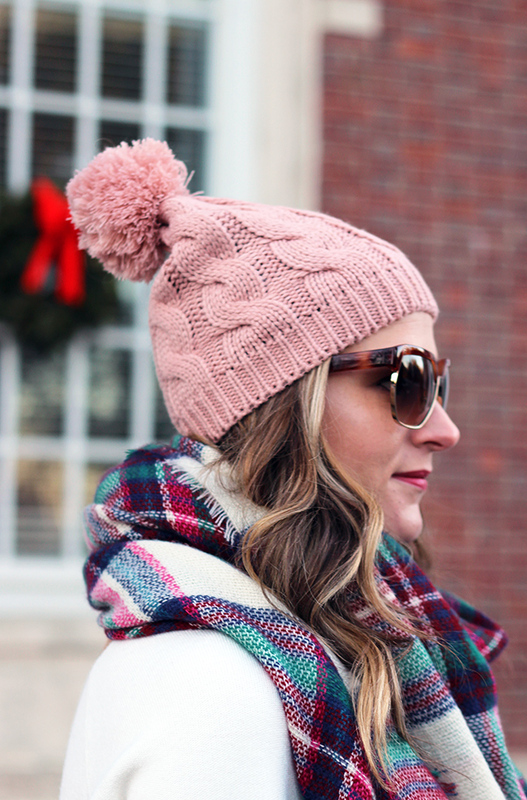 I totally agree that a beanie is the perfect finishing touch to any winter look. This pink one is so cute! It's funny, because yesterday I was searching the web for a pink one, and now you have this cute one on! Definitely going to check it out...Have a great weekend! Such a cute look! I love the beanie and scarf! Love the hat & scarf duo!! Happy Friday, babe! I love beanies, too. Especially yours because it is PINK! I like blanket scarves, but I can never figure out how to wear it/wrap it perfectly. I need to do some research. Fabulous winter look! I so agree with you about beanies completing your winter outfit. I bought several news ones this year. I also love not having to worry about styling my hair. Just pop on a beanie, and I'm good to go! I am just loving the colors in that scarf. I need to get some more beanies in other colors, I have a gray one. It IS great for covering up morning hair or even wet hair! It's hard to believe that winter only just started two weeks ago and we've still got to make it through two and a half (but really more like four) months of winter. At least we've got the promise of spring and the comfort of being able to get away with wearing leggings as pants to get us through. You look so comfy and stylish! Love the color of your beanie and just your overall outfit is winter perfection! Thanks for hosting! I feel like you must be a pro at winter dressing. I love your beanie and blanket scarf. Have a wonderful weekend! You are looking so cool dear, amazing scarf! Definitely agree with all 3 essentials, specially the scarf! Love the color of that blanket scarf! Such a lovely outfit, perfect for winter! This outfit looks so cosy and warm, makes me miss winter over here in sunny Australia! Thanks for sharing, have a great day. Love the sweater and that scarf, so cute! This outfit is winter perfection!! I definitely love to wear combinations of this, so cozy! Perfect cozy look! I'm all about big scarves! Girl this outfit is perfect!! Love your scarf and hat :) Perfect accessories! such a cozy outfit! 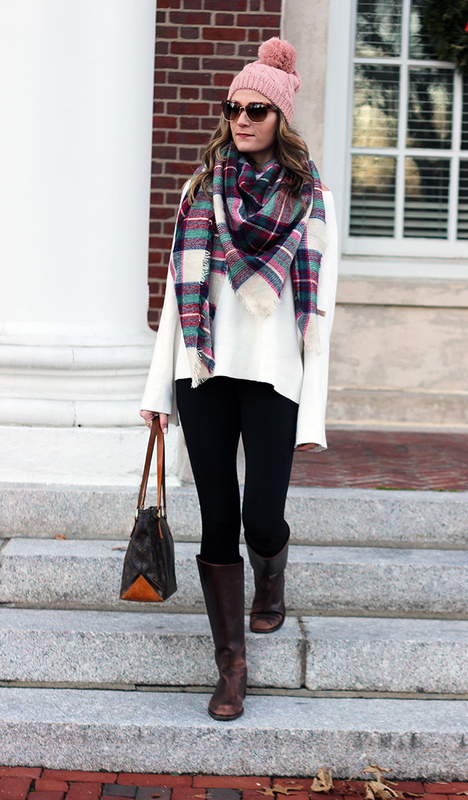 you can never go wrong with plaid and boots!